Slow-cooked green beans with onions and bacon drippings. Sometimes I think I could be a vegetarian. And then I remember how much I love fried chicken and onion sausage and ribeyes and I’m cured of that delusion. But sometimes, though, seriously, I’m totally content with a big ole plate of vegetables. 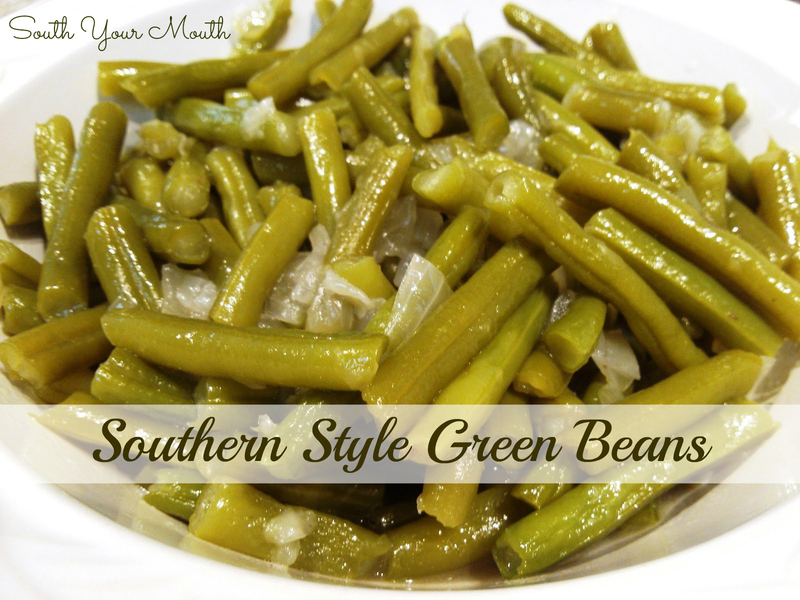 Slow-cooked, Southern-style green beans are one of the vegetables that could call me to the vegetarian altar. I could seriously eat a quart of them. And serve them with a few wedges of skillet cornbread too?? Y’all wouldn't hear from me for hours. I’d just be sitting in the corner somewhere eating my green beans and cornbread hoping nobody else wanted any. And don’t get me wrong, I like green beans cooked in more delicate ways where they’re only slightly cooked and served al dente too. I just like them like this better. Rinse beans in cold water. Snap the ends off the beans then snap each bean into 2-inch pieces. Set aside. Heat bacon drippings in a large skillet over medium-high heat (feel free to just chop up some bacon and cook it down a little with the onions rather than just using the drippings). Add onion and sauté for 2-3 minutes. Add beans and continue sautéing for an additional 5 minutes or until onions are translucent. Add beans and onions to a medium-sized saucepan. Add chicken broth and salt, stir to combine, then cover and cook over medium-low heat for one hour, stirring occasionally. *Substitute vegetable or olive oil for bacon drippings if necessary then ask the Lord for forgiveness for throwing away your bacon grease. slow cooked with some taters....mmmmmmhhmmmm... and don't forget the corn on the cob! Yup, sounds just like my momma's (AND MY) green beans! I've never tried them with the onion, but the bacon grease? OH YEA!!! II even take canned green beans and make them this way. Taste like homemade? Sure do!!! I also add some fresh garlic - bacon ends - cherry tomatoes - parsley flakes - scallions and almonds to my beans. Pss... don't be afraid to add plenty of Bacon to these beans !!! they really make this meal Hearty !!!! Great Recipe !!!! Thanks for the Share !!! I have been searching for my grandmother's green beans for 20 years ( i'm 43), this is it spot on. Thank you so much for this recipe!!! I have been cooking it all at once, never sauteing first. This made all the difference in the world! My Hungarian granmom did this but with a tablespoon of paprika when cooking and sour cream before serving. I was wondering when you make these beans and use canned beans do you still let them cook for an hour or for less time? I always cook canned green beans like that. I cook my chopped bacon with onion then add all to a couple cans of green beans and cook at least an hour or even longer. For the first time, I tried to emulate my Mimi's southern style green beans tonight! I think I'm missing something, and next time, I will saute some onion in my bacon fat! She added a bit of sugar too! But it was very close! Thanks for the recipe! sautéing brings the real taste of food to other foods, yes,yes. I must have a bit of southern in me somewhere (born in Indiana and loving life in Colorado) ... making ANOTHER batch of Mandy's beans. Gladly picked up the 2 lb bag at COSTCO even though we're empty nesters. These beans from heaven can easily be my lunch at work all - by - themselves! This is one of my favorite green bean recipes.....to the recipe above, don't add as much water, add browned bacon, chili powder and tomato juice (either regular or spicy). Simmer. We call this Spanish Green Beans at our house, and it is amazing!